This beautiful little Girl,along with her brother Coner blessed Mine & My husbands heart two and a half years ago. She was a special little girl who was always at her brothers side,as well as always being my shadow. We spent a lot of time together, mostly all day every day. My best friend. She loved playing with Coner even tho he was always very protective and smothering with her and it would get on her nerves at times they were still the best of friends. One of my fondest memories is how sometimes after she would eat and her belly was full she loved her feet and back rubbed. 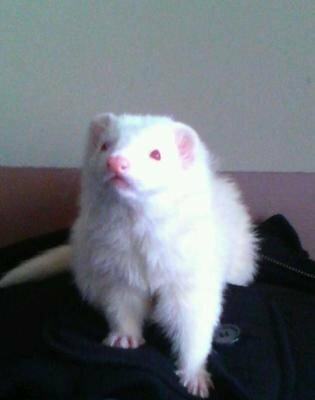 I was always very cautious,or so I thought due to the fact that we all shared a living space because they had free roam of my studio "ferret proof" apartment. I have a cage but they were only caged for a short time after I purchased them. On the day of April 9 2014 it turned very tragic. As I was getting ready to go and take a shower Girl and I were playing and when I had last saw her she was way across the room. So as I was gathering up my towel and things for the shower She must have very quickly ran under my feet and I had stepped on her. After that I was heartbroken,panicked,devastated. She was in shock at first,then she would try to walk,she would take a few steps and drop. To make a long heartwrenching story short I ended up having to take her and get her put down due to internal bleeding. This is one of the hardest things I ever had to go thru. And also having to deal with her brothers grief as well as mine and my husbands. We will always love and miss you my little Girl and you will always be in our hearts forever. I know you are over the Rainbow Bridge now dooking in peace with Dooker, Marty and Salvie. I know they will love you just as much as we did. Momma is so sorry baby. But we will all meet again one day. To anyone reading this,always remember you can never be too careful and please always be mindful of where you are stepping. Love Your Momma,Your Father and Coner. Oh gosh, this is heartbreaking. They can be so fast and sneaky that accidents like this happen before you realize it. It happened so fast Nadia. It was like i was in some kind of awful nightmare. Never,ever,could I imagine something like that happening, I always tried to be so cautious, and gentle with her. It's devastating. She was only 2 and a half years old.